More than 94 species of fiddler crabs compose the Uca genus of the Ocypodidae family. Many pet stores sell Uca minax, red-jointed fiddler crabs, for home aquariums and hobbyists to raise and enjoy. Fiddler crabs are fairly small, typically measuring 1 to 2 inches -- so they don't need huge aquariums. In the wild, fiddler crabs are native to marshes, swamps and mudflats with brackish water and sand or mud terrain. Your captive fiddlers need both land and water areas in their aquarium. When designing an aquarium, you want to make sure the ratio of land and water is 50/50. In order to be able to create adequate housing area, you'll need an aquarium of no less than 10 gallons for up to four crabs. There are different ways to set up the land area area inside the aquarium. You can use plexiglass or an aquarium divider to separate land and water. Or, you can use substrate to create a sloping surface, the substrate sloping into the water so the crab can get onto land. Use coarse sand, such as aquarium sand, play sand or pool filter sand for the land. The fiddler crab is a burrower, so you don't want to use gravel throughout the land area; he will sift through the sand to find bits of food. A fiddler crab needs a water area, but you want to watch the salinity, as the fiddler crab isn't 100 percent freshwater. 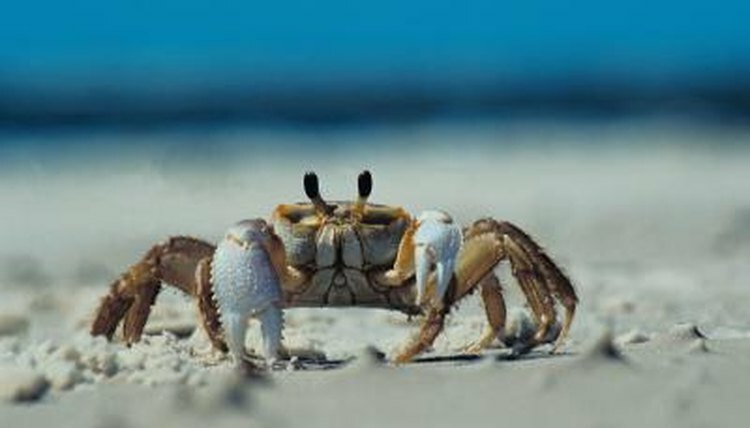 If you maintain the water as freshwater, the crab will not survive very long; but if you ensure slight salinity, making brackish water, the fiddler crab can live up to three years. You want to maintain the water specific gravity between 1.005 to 1.015 by adding marine salt to the water -- find out the appropriate amount for your species and the water volume. When setting up the water area, it's a good idea to add small pebbles or gravel to the bottom of the tank and to create a slope so the crab can easily climb in and out of the water. Once the water and land areas of the aquarium are set up, you want to make sure the temperature is accurate. Use a digital thermometer with a probe to ensure the temperature is between 75 and 82 degrees Fahrenheit. If the aquarium needs supplemental heat, use a reptile-specific heat bulb. You can place the fixture above the land area so the fiddler crab can climb out of the water and bask to warm up. The fiddler crab is a scavenger; he will sift through the sand and between gravel for food. In the wild, he will eat algae and any organic matter he finds. In captivity, you can feed a fiddler crab a variety of commercial foods, including algae wagers, sinking pellets, specialized crab food, dried bloodworms, shrimp and krill. You can offer blanched zucchini, blanched peas and raw or boiled fish.